This week is going to be an incredibly crazy week for me and I am excited about it! I start a wax casting jewelry class tonight in Providence, which is a bit of a drive. I am taking it with a really good friend of mine who lives in the area and we get to hang out all evening. Tomorrow there is a day long workshop that I need to attend and then on Friday I have a meet and greet for the graduate program that I am highly interested in. These are all really exciting and fun activities, but unfortunately I have an electrodynamics exam looming over my head. I still have a week to study for it which is good since it is a rather difficult class. I started sewing dresses again after taking a month off. I made a really fun one yesterday, but I am going to wait until I wear it to post it here. I still have not posted most of the dresses that I made over the summer, so I should start now! 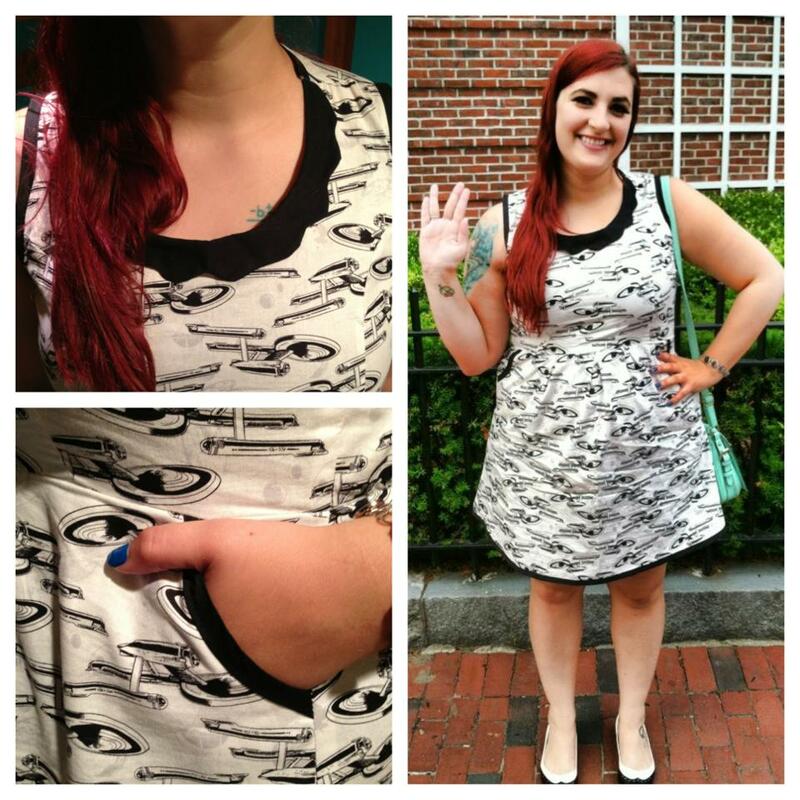 This is the third dress that I made, and it is a Star Trek dress (duh)! I saw this fabric at JoAnn’s and thought it would look really cute as a dress with a black collar. Sadly, I am not the most die-hard Star Trek fan; I got started on the series late, in my early 20s. But I do enjoy the shows, movies, books and comics (so much Star Trek)! This dress receives a lot of compliments when I wear this to the planetarium. This was my first attempt at a scalloped collar, and I have since gotten better. I do love sewing my own dresses because I can always make pockets. I actually design and make all the dress patterns myself so I have complete control over the style and fit of the dress. Well, I am off to finish a physics assignment then head to Providence for my class! I will post another dress from the summer soon! The dress and the fabric is adorable!